(12:00 p.m. ET) -- A woman who drank too much and then jumped off her cruise ship balcony is suing Carnival Corp. for delaying her rescue and then refusing to adequately treat her. Sarah Alexandra Badley Kirby was on a five-night Caribbean cruise onboard Carnival Destiny in October 2012 when the incident occurred. Though Kirby alleges in her suit that she fell from her balcony, witnesses told Carnival Cruise Lines she jumped, Cruise Critic reported at the time. According to Courthouse News Service, lawyers for Kirby wrote that after becoming "extremely intoxicated," she stepped on to her balcony for air. "As she was holding on to the balcony's wooden banister, the plaintiff lost her grip and balance, slipped off the ground and fell overboard into the ocean." Kirby alleges in her lawsuit that despite a friend immediately reporting that Kirby went overboard, the captain of the ship refused to stop or turn around until a 90-minute shipwide search had been conducted. Once the ship did turn around and rescue Kirby from the water, she claims ship doctors refused to treat her injuries (including multiple broken bones, lung contusions and blood clots), giving her only pain medication. 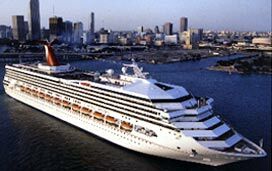 Additionally, she claims Carnival refused to airlift her to a hospital in Miami, instead diverting the ship to Key West. Kirby further accused Carnival of getting her drunk by "pushing" Long Island iced-teas on her and encouraging her to drink more by giving her free $5 casino coupons each time she purchased more drinks. She is suing Carnival Corp., as well as four people, including two of the doctors on the ship at the time, for negligence and intentional infliction of emotional distress. Cruise Critic has reached out to Carnival for a response to the lawsuit.